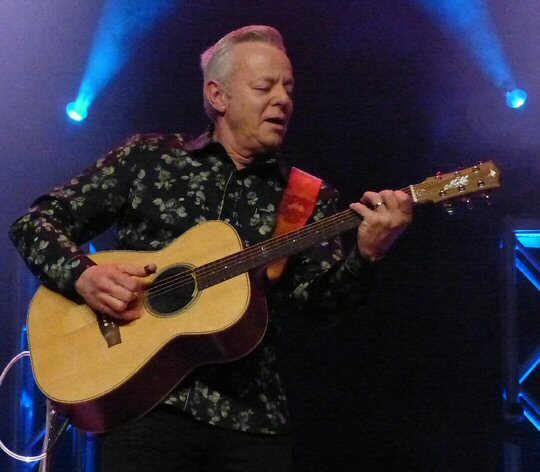 Tommy Emmanuel is one of Australia’s most well-loved musicians worldwide. The guitarist currently lives in Nashville, Tennessee thus he was performing to a hometown audience on Febraury 27, 2016 when he played to a capacity crowd at the Ryman Auditorium. The entertainer mentioned from the stage that he’d been dreaming of headlining this venue since he was a young boy. 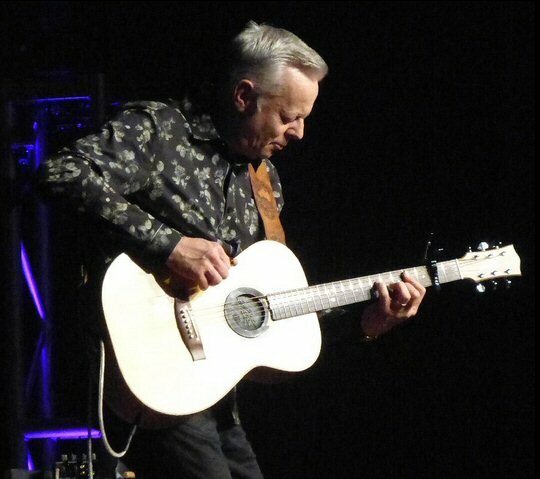 Nashvillian Tommy Emmanuel takes center stage at the Ryman. 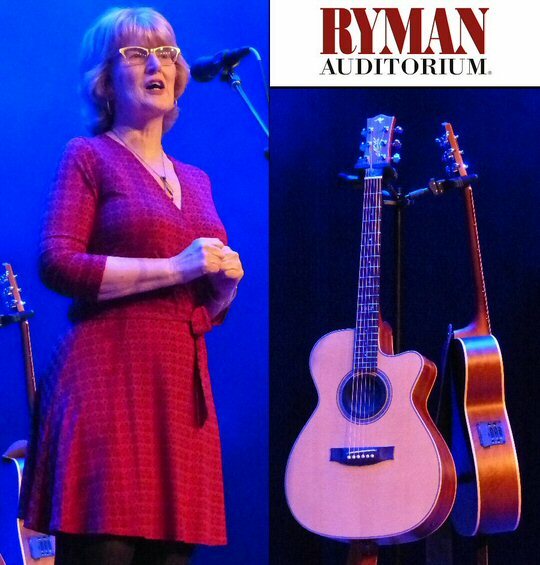 Beth Curley, President and CEO of Nashville Public Television appeared on stage to introduce and thank Tommy Emmanuel for his work in supporting the station over the years. This show at the Ryman was also being recorded perhaps for a future broadcast on the network. Over the course of his five decade career Tommy has earned numerous accolades and awards including the rare title of Certified Guitar Player (CGP) from the late yet still legendary Chet Atkins whose influence is still very much present in Music City. Emmanuel is a fluid fingerstyle guitarist who can play not one but three segments at once. He enthralled fans with his strumming and style that runs the range from blues to world. Tommy’s stage set-up at the Mother Church of Country Music was simple with a few amps and two acoustic guitars. Tommy walked out armed with a third to present a piece of pretty picking that flowed into a fast and fluid instrumental paired with thumps for rhythm. “Thank you ladies and gentlemen,” greeted Tommy. “Did you enjoy Paul Thorn (the opener),” inquired Emmanuel who observed that there is so much love in these walls. The next song in honor of Chet Atkins was filled with mixed approaches to the acoustic. Tommy had such command of the instrument blending picking, strumming, taps and thumps sometimes in the same composition. Yet it’s not all technique but his true passion for music that is so endearing. Emmanuel’s complex and intricate style of playing is in a category all of its own. Emmanuel shared that last year he became an ambassador for an organization called Guitars For Vets. This non-profit buys guitars and provides lessons for vets to help them in the healing process. Tommy dedicated “Blood Brothers” to those who serve. It featured long lavish leads that progressed from delicate to dramatic. Tommy mentioned that when he first composed “Angelina” for his daughter he had not intended to write words but they came thus the tune is now a sweet love song to a child. “The Tall Fiddler” was penned for a fiddling friend in Kentucky. The lead into the song included a memory about Ricky Skaggs. The multi-part number moved fast just as a fiddle might. “Have we got any Rolling Stone fans here?,” Tommy asked. “Well, good here’s some Beatles’ songs,” he jested before adding, “I play these songs because they need the royalties.” He then shared a story about working with Bill Wyman and meeting George Harrison before presenting an innovative medley of the Fab Four’s music starting with a winsome “While My Guitar Gently Weeps” moving into a delightful “Day Tripper” and later a layered “Lady Madonna”. Emmanuel mentioned the CGP title stating that they were only three of them left. 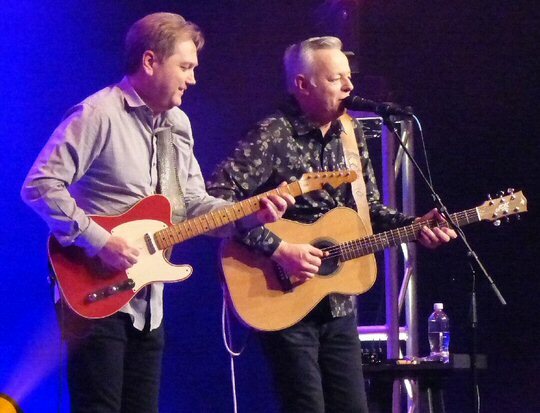 Steve Wariner first then John Knowles were Emmanuel’s special guests on Saturday night. It was picking paradise even with Steve on an electric. Tommy teased Steve saying that Wariner had a red guitar that goes faster. It was a treat to see these three pros play together and trade leads. Fellow “Certified Guitar Player” Steve Wariner joined Emmanuel for several songs. Tommy mentioned that he had the pleasure of performing at Les Paul’s 90th Birthday Bash in 2005. Emmanuel had an opportunity to talk to Paul about all the people Les had played with. Les recalled that Judy Garland often brought people to tears when she sang the famous song from the Wizard of Oz. In honor of the guitar innovator and “Dorothy” Tommy played a cascading and colorful version of “Over The Rainbow” which earned Tommy another standing ovation for the night. Tommy said that since he was eight years old he dreamed of playing the Ryman declaring that he would not be here if it was not for Chet. Tommy continued to captivate the audience well into his encore with more innovative instrumentals that included a beguiling “How Deep Is Your Love” by the Bee Gees. This may have been Emmanuel’s first engagement at the Ryman but its likely Tommy will be back to preach the picking gospel again. 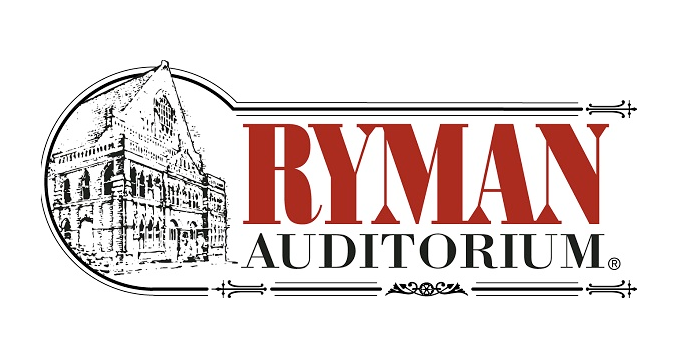 The Ryman Auditorium in Nashville is the Mother Church of Country Music but she continues to showcase a wide array of artists such as Tommy Emmanuel. The venue reflects its history with wooden pew seating paired with modern lighting and sound. Some consider it one of the finest sounding rooms in the States. Upcoming events at the Ryman include Leon Bridges, Tedeschi Trucks Band, Sam’s Place, George Thorogood, Merle Haggard and Adam Lambert. Beth Curley, President and CEO of WNPT and Tommy’s guitars.